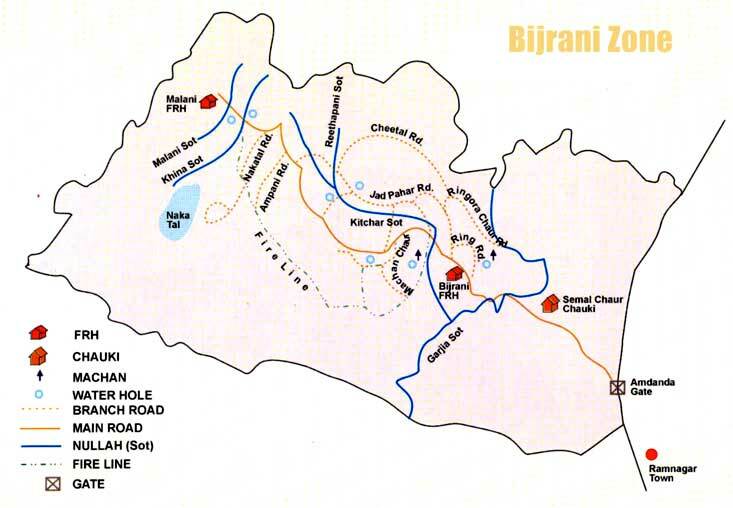 Birjani Tourist Zone is a very popular area of the spectacular Corbett Tiger Reserve. This zone is enriched with a huge number of floral and faunal species. Birjani gives a tough competition to Dhikala zone while the tourist's preferences are concerned. The zone is known for its wonderful landscape and is very calm and quite place. The beauty of this place is appreciated by all the visitors. This is one of the most tiger rich areas of the park.Birjani consists of a mixed topography with dense Sal forests combined with grasslands. The entry to this zone is through Aamdanda Gate. The forest area of Birjani is purely serene and perfect for the tranquil atmosphere. It is seen that the forest vegetation is mainly Sal along with wide grasslands known as Chaur. The topography at Birjani is a bit drier and has diverse character. Several types of deers and antilopes namely Chital (Axis axis), Hog Deer or Para (Axis pornicus), Sambar (Cervus Unicolor), Kakkar (Muntiacus Muntjak) etc are seen here.